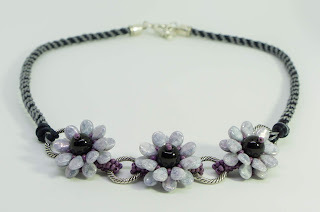 Things are still a little bit topsy-turvy in my life at the moment, so this will be another brief post, but I wanted to show you a few little pieces I made using PRECIOSA Two-Cut Beads. 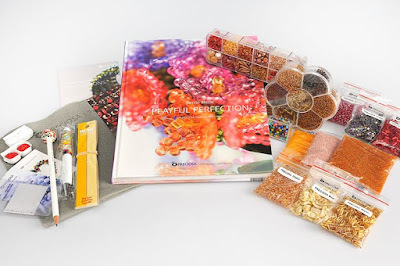 I have quite a lot of cut beads in my collection, ranging from Two-Cut and Three-Cut, to various sizes of Bugles, and although I love the way the light glints and reflects off the cut edge, I've been more a collector of cut beads rather than a user. 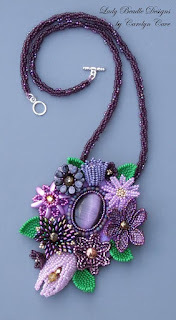 I must admit that I used to shy away from any cut beads as I feared that they would have sharp edges that would sever my beading thread, undoing all the hard work in a carefully crafted piece of beadwork. However, not long ago, Preciosa Ornela asked me to work with some of their Two-Cut beads and so I put my fears to one side and gave it a go. 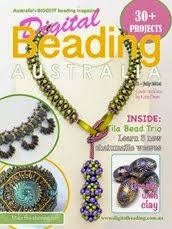 Instead of jumping in with both feet, I thought I would take my introduction to weaving with cut beads slowly. I decided to make a simple Kumihimo bracelet to start with, which would enable me to use thick S-Lon thread, therefore reducing the thread-slicing risk. 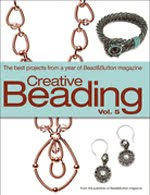 The lovely rhythmic braiding process gave me chance to look closely at the beads, to get to know them a bit better and to start to relax. I chose red and blue Two-Cuts and mixed them with some white size 7 rocailles and white S-Lon to give a patriotic feel - the colours of both the UK and Czech Republic flag! 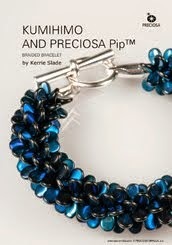 I made the bracelet long enough to wrap twice around my wrist, and added a little button and loop closure. 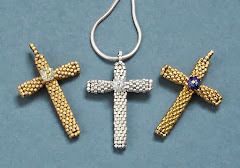 Although I was happy with the results of my first piece, I still didn't quite have the confidence to use my usual Nymo or Fireline with them in basic beadweaving stitches. 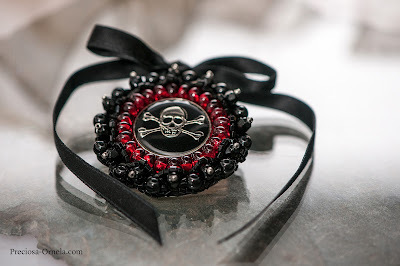 So next I did a bit of embroidery using Ultrasuede and heavy duty 14lb Fireline to create a Gothic style brooch. I used a mix of Two-Cuts, Drops, fire polished beads and Charlottes to circle a glass button with a skull and crossbones design and completed the look with a drooping black ribbon bow. 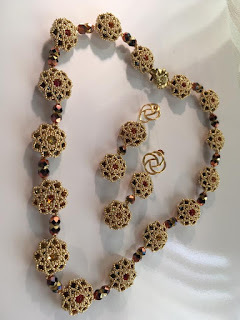 I had absolutely no problem with the Two-Cuts and the thicker Fireline, so by now I was starting to wonder if I had spent years missing out on using cut beads in my designs because of my unnecessary fear of them. 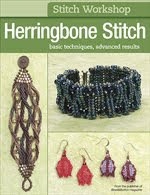 So for my final Two-Cut piece, I went back to what I know best - 6lb Fireline and herringbone stitch! 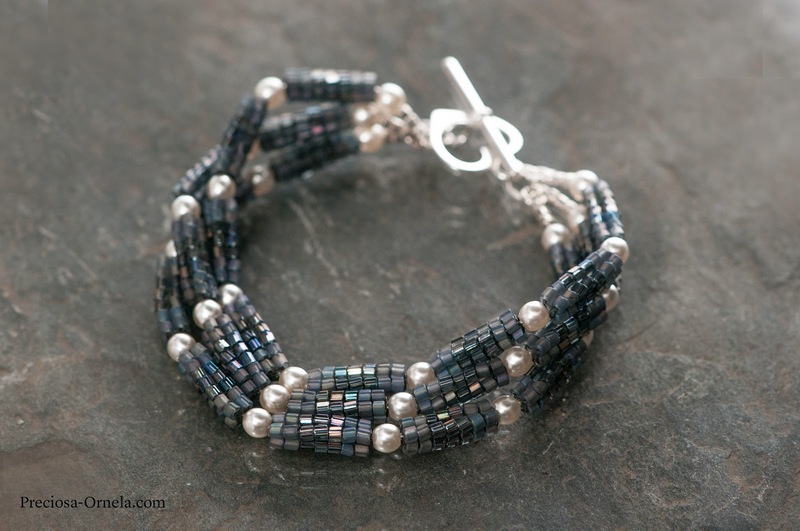 I made lots of little beaded tubes with grey AB Two-Cuts in both shiny and matte, threaded them onto sterling silver beading chain along with some cream 4mm glass pearls, and then added a sterling silver clasp to make a three row bracelet with lots of movement. 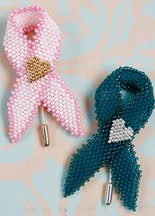 This is the sort of beadwork I love to do and I made 24 of these little tubes with absolutely no trouble at all. 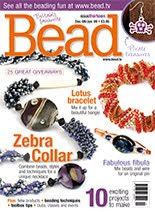 None of the beads cut my thread while I was working with them and the bracelet has been worn repeatedly with no problems. 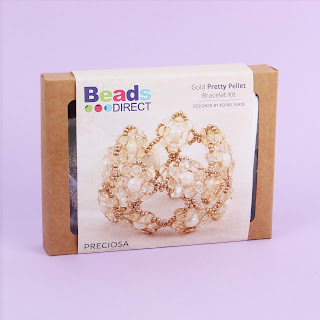 So there - accepting the opportunity to work with PRECIOSA Two-Cut Beads not only gave me chance to work with interesting bead shapes and colours, it also cured me of my phobia of cut beads! 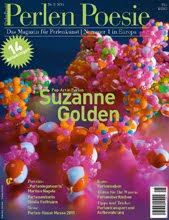 I'm going to keep this brief, as my father has recently passed away and there is a lot of work for me to do. 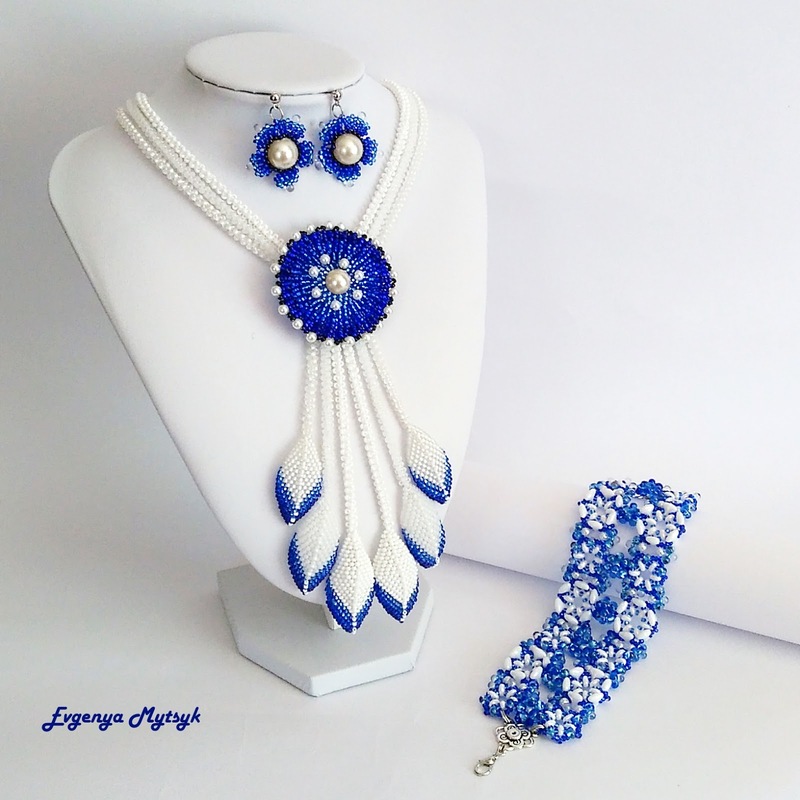 But, I didn't want to keep you waiting any longer, so here are the winners of my International Beading Week contest in association with Preciosa Ornela. 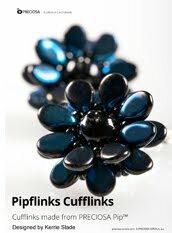 And a special mention and small prize also goes to Anna for her entry, as she is only 13 years old! 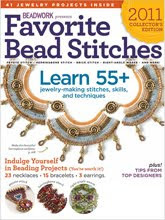 Thank you so much to everyone from around the world who joined in with IBW and entered the contest. 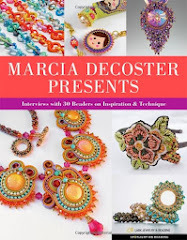 Both myself and Preciosa agreed that it was incredibly hard to choose the winning pieces as there were so many wonderful, intricate and imaginative entries. 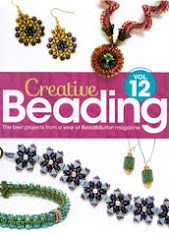 If you have not been awarded a prize this time, please do not be disheartened, every entry I received showed hard work, patience and a love of beadwork - keep on beading! 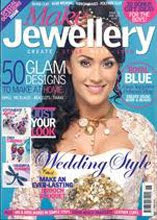 Will the 11 winners please contact me as soon as possible with their postal address so that the prizes may be sent out. 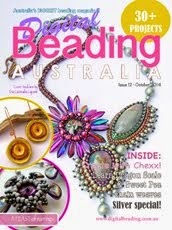 International Beading Week - It's Here! 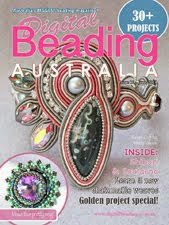 Well here we are, after all the anticipation and behind the scenes preparation - International Beading Week is upon us! 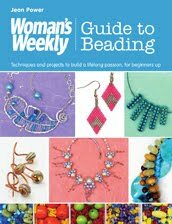 There are all sorts of great offers and events taking place all over the world, so be sure to check out the menu on the IBW website. 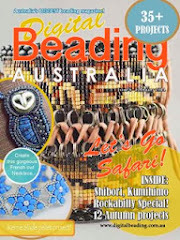 I've often said how much I appreciate the way modern technology enables us to connect, and I generally consider myself to be an international beader, but the build up to IBW has been a particularly exciting time for me. 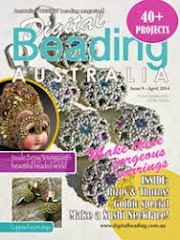 For the last couple of months I've been working with companies from the UK, Czech Republic and Germany, posting books to the USA, Portugal and Austria, answering beady queries from Cameroon, Nigeria and Canada and processing contest entries from the UK, USA, Ukraine, Germany, Greece, Slovenia, Lithuania, Italy and India! You still have one week to send me your contest entry photos to be in with a chance of winning a copy of my book and a kilo of beads from the PRECIOSA Traditional Czech Beads™ brand, as shown in the photo below. 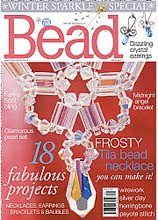 Find one of my patterns, make it with beads from Preciosa and send me a picture, it's as simple as that - just imagine what sparkly things you could make with that lot! For my next IBW initiative, I've teamed up with Beads Direct to design an exclusive kit, which has been launched today and is available to purchase from their website. Designed and written by me and beautifully packaged by Beads Direct, Pretty Pellets is a softly romantic looking bracelet made with PRECIOSA Rocailles, Imitation Pearls and Pellets™. 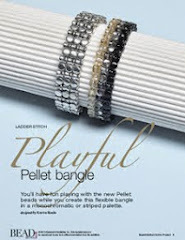 You have the option to make a simple single row bracelet, or a more elaborate double row cuff style bracelet. 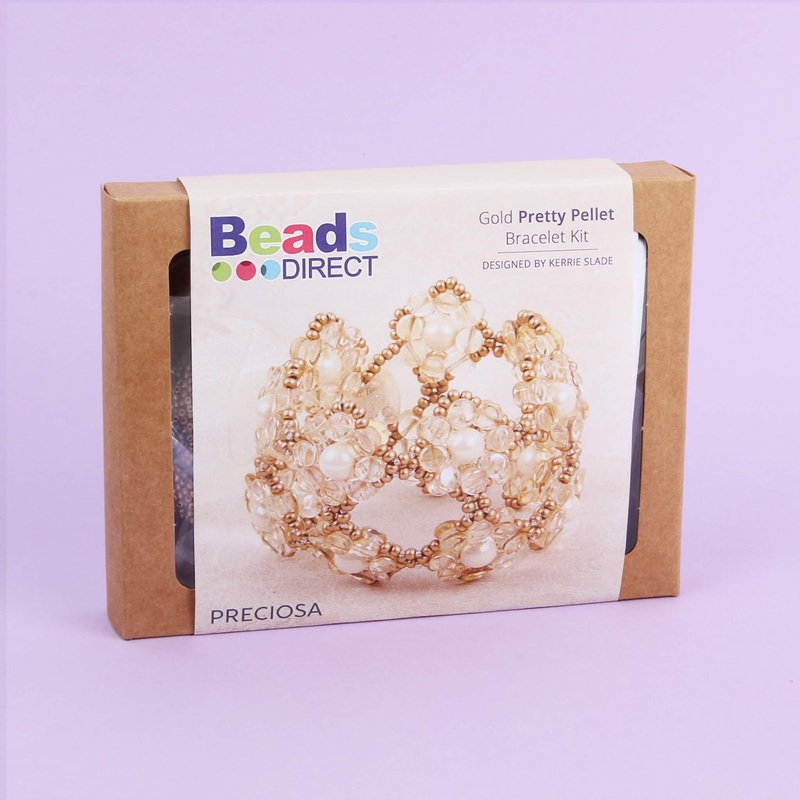 Each kit contains sufficient materials to make two single row or one double row bracelet and comes in either gold or silver colourways. 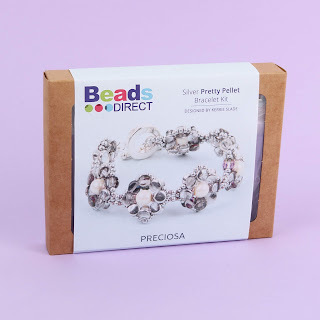 We hope you enjoy making your Pretty Pellets - be sure to join in with the International Beading Week buzz and share photos of your bracelets on Facebook on either my page, Beads Direct or on the International Beading Week page using #IBW. 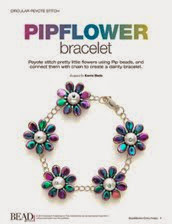 Mix and Match Flower Bracelets! What's this? 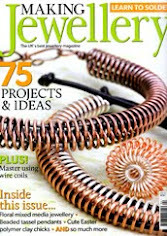 Nothing on the blog for a year and a half and then two entries within ten days?! 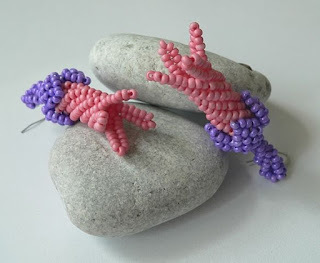 Well, as I hinted in the last blog post I've just had my 85th pattern published. 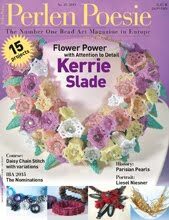 This time it's a fun summery project 'Mix and Match Flower Bracelets' which you can find in issue 87 of Bead and Jewellery magazine which is out now. 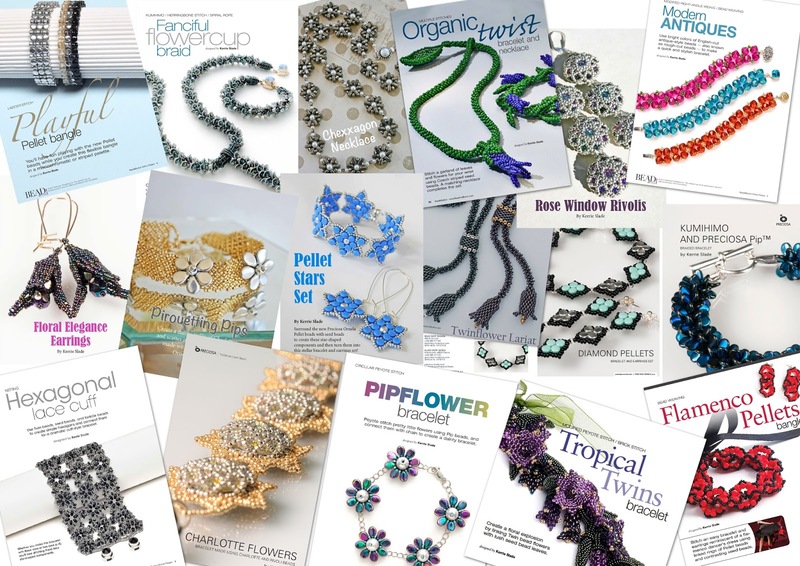 A couple of years ago, I was fortunate enough to celebrate my 50th birthday in Madeira, where I discovered that cork is used to make everything from jewellery to clothing. I learned that cork is a sustainable natural product harvested from the Quercus suber tree (cork oak) and I believe that most cork forests are actually in Portugal and Spain. While in Madeira, Simon bought himself a cork wallet and it's such a beautiful soft material that most people don't realise what it's made from when they see it. 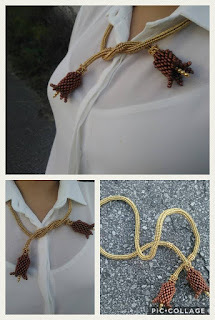 I treated myself to a cork bracelet which I sadly lost, so I was very pleased when I later discovered that I could buy the cord and incorporate it into my own jewellery designs. 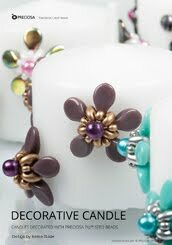 I love the look and feel of the natural cord, but I've chosen to use pastel coloured cork cord from Endless Leather for these pretty little bracelets as it perfectly compliments the lovely transparent and opaque PRECIOSA rocailles I've used to make the flowers. 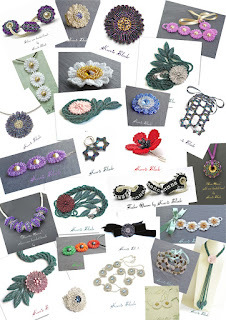 I've called this project 'Mix and Match' because these simple flower shapes are made in two layers, which means you can slide them on and off the cord and jewellery findings to change the colour combination for alternative looks. 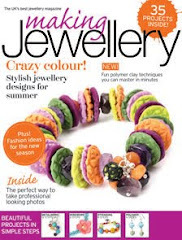 I decided to make my bracelets in delicate pastel colours of yellow, apricot and rose, but if girly isn't your thing, you could easily make them in darker or more muted tones, or even go for bold neon colours for a completely different look. 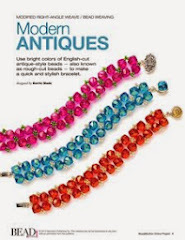 The cord is only 10 mm wide so these also make great stacking bracelets which is in tune with the current festival trend. 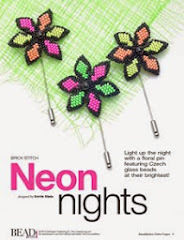 I hope you enjoy this quick and easy project, and don't forget you can also use this pattern if you want to have a go at winning the prizes I am currently offering in my contest. 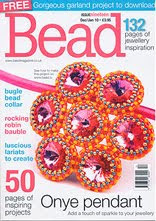 International Beading Week - Competition time! 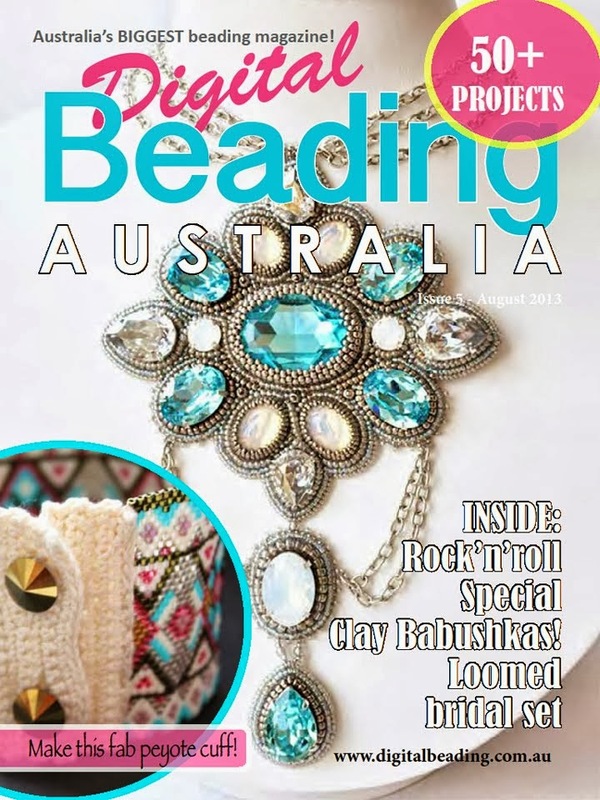 It's been a little while since I updated my blog, but here I am, and with news! 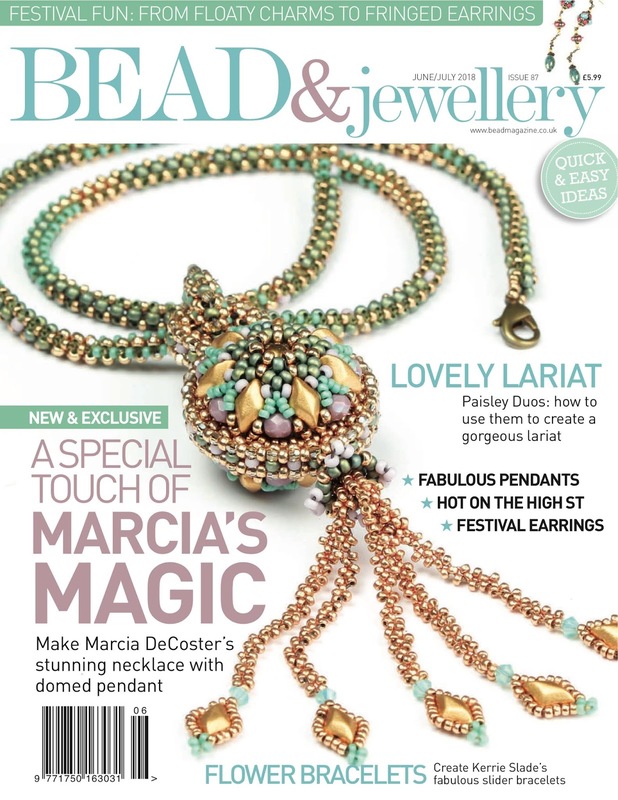 I've been involved in National Beading Week since it began in 2015, but this year it has morphed into INTERnational Beading Week and I'm delighted to be one of the ambassadors. 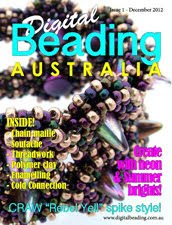 International Beading Week takes place from the 28th of July to the 5th of August this year and there will be all kinds of exciting worldwide beady activities taking place. 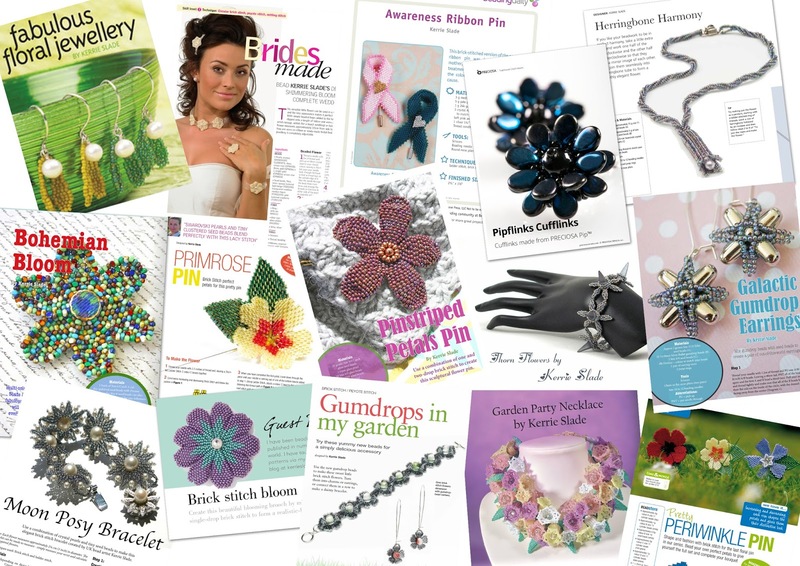 Keep a close eye on the menu at the top of the IBW page as details of events, special offers and freebies will be added soon. I have several things planned, but the first thing I wanted to tell you about is that I am holding a contest which is open internationally. 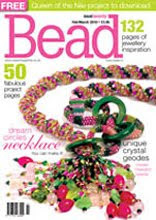 There are five fantastic prizes on offer (more on that below) and to be in with a chance of winning there are two main requirements: the first is that you make something using one of my patterns, and the second is that it must be made using seed beads and/or beads from the PRECIOSA Traditional Czech Beads™ brand. 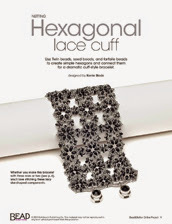 It could be one of the patterns I sell via my website, one from my book Playful Perfection, one of my free patterns available from the Preciosa Ornela project page or one of the many that I have published in books and magazines over the years. 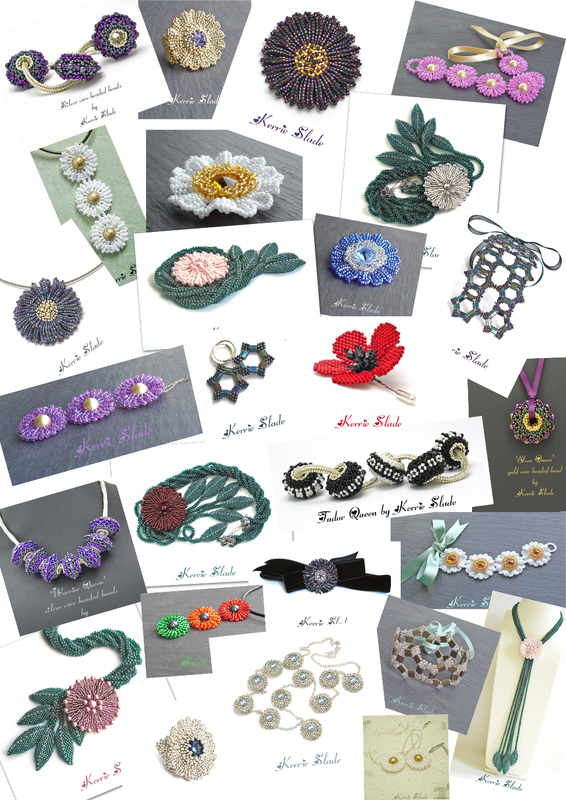 I actually did a count yesterday and was quite shocked to realise that I have published 84 different patterns (soon to be 85!) so there are plenty to choose from, as you can see below. 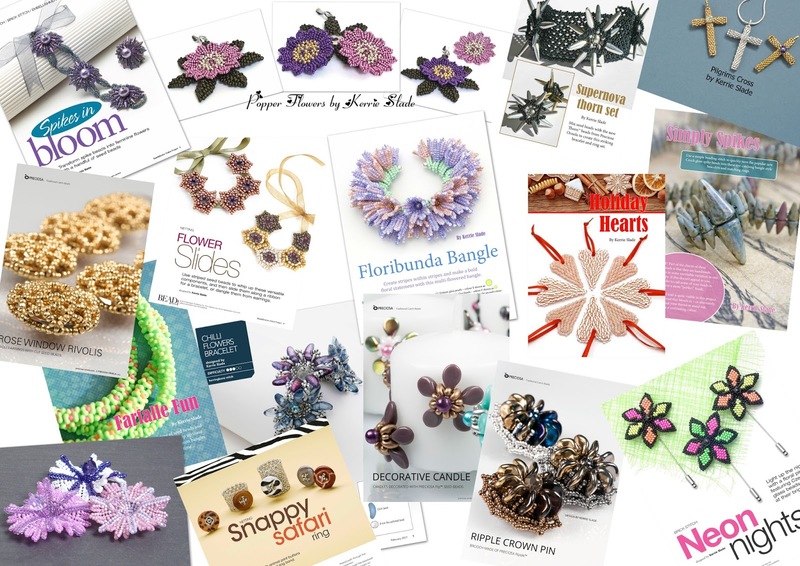 You could make a simple pair of cufflinks in a couple of hours, or you could spend considerably more time making one of my floral lariats for example - from beginner to advanced, there is something out there for everyone. 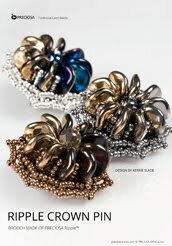 It doesn't matter which project you make, whether you make an identical piece or adapt it. 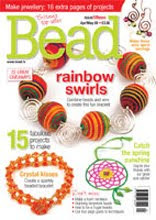 You might like to change the colours, turn a bracelet pattern into a necklace, try using different sized seed beads and beads, whatever you wish, but it should be clearly identifiable as originating from one of my patterns. Some of my designs call for specific types of beads, so unless you want to have some fun seeing if they work with other types, choose your pattern carefully. When you have finished your piece, take a picture of it and either post it on my Facebook business page and tag me, send me the picture via Facebook Messenger or email me (address can be found at the bottom of my website). Please make sure I have a way to contact you should you be one of the lucky winners, and if you are, we will then need your postal address to send you the goodies. 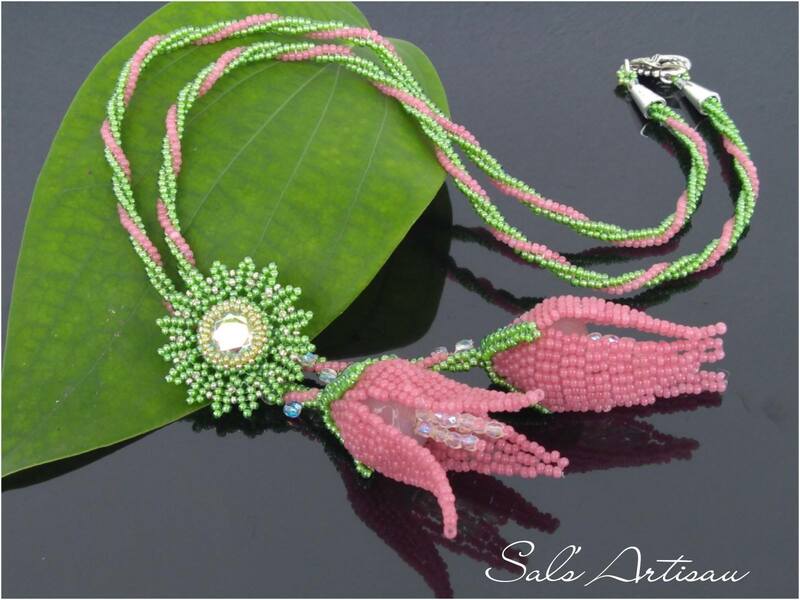 The contest will be judged by both myself and Preciosa Ornela and the final five will not necessarily be selected due to the complexity of the piece, but rather the workmanship, attention to detail and overall pleasing appearance. Preciosa Ornela is generously providing five equal prizes of a copy of my book and 1kg of beads (yes you read that right - one whole kilogram of beads! 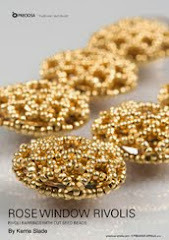 ), which, as you can see from the sample photo above, is a whole lot of beautiful beads. 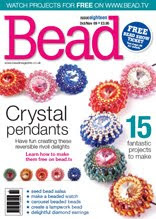 So if you want to increase your bead collection, or maybe experiment with some new shapes that you've never tried before, it's well worth having a go at this contest! 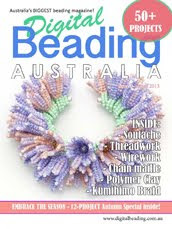 I'm so glad to be in a position to be able to embrace the spirit of International Beading Week and share the beady love worldwide, and I'm really looking forward to seeing which piece you decide to make. 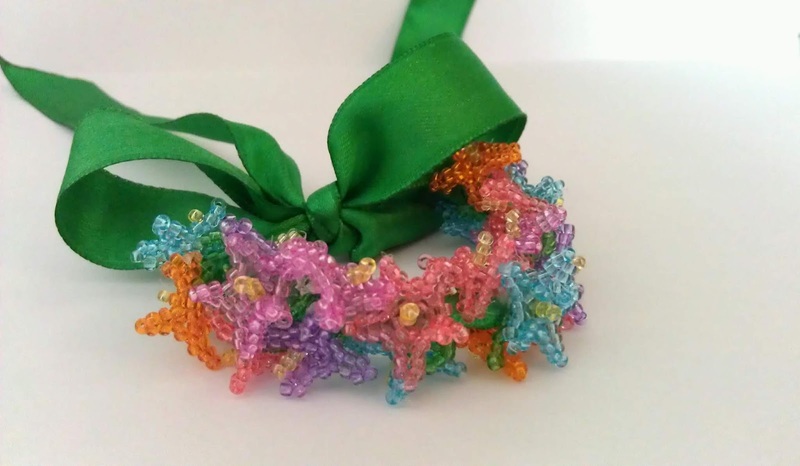 The contest is now open, the closing date is the 6th of August 2018 and the winners will be announced on my blog the following week. Good luck everyone! 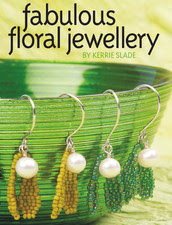 I've written a book! 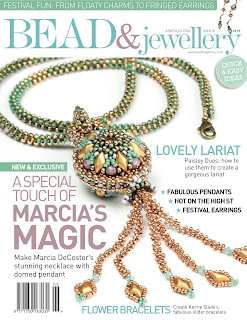 My poor old blog has been very neglected throughout 2016, but back in May I dropped a hint that I was busy working behind the scenes on a big top secret project which I can now reveal - the Playful Perfection project book in association with PRECIOSA Traditional Czech Beads™. 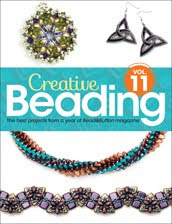 I spent the best part of a year planning and writing this book, and with enormous help from Preciosa Ornela, the result is a 150 page hardback book containing 30 projects divided into 4 sections: Necklaces, Bracelets, Other Jewellery and Decorations. 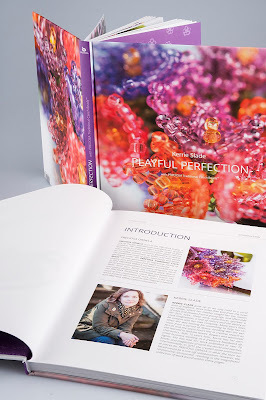 Each project includes a paragraph about my thoughts and inspiration behind the design, useful information about the piece (such as size, technique and difficulty level), a list of required materials and tools and step-by-step instructions with detailed diagrams. 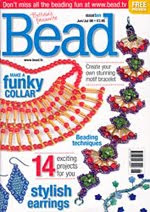 The projects use a variety of widely available shaped beads and easy to source seed beads and findings. 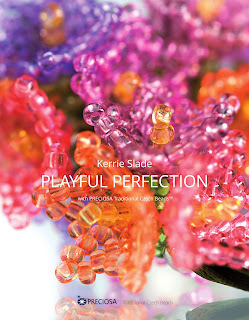 Playful Perfection is actually a collection of some of my design work with Preciosa Ornela over the last 4 years, and so it pulls together 19 projects that have previously been published in various international publications and also includes 11 brand new and exclusive projects. Some of the older projects have been reworked (for example Pirouetting Pips which was originally published in the Australian publication Digital Beading Magazine as a delicate gold and silver bracelet is now a striking black and white choker style necklace) however, please be aware that only 11 of the projects are new to publication and so you may already have some of the others in your pattern collection. 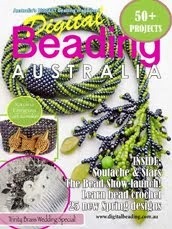 If you would like a sneak peek inside the book, there is a video showing all the projects here. 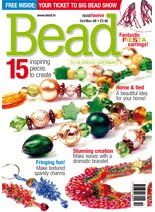 The book will be available from distributors of PRECIOSA Traditional Czech Beads and bead stores around the world, but there is a limited supply of signed copies of the book for sale directly from my website which will be available on a first come, first served basis. 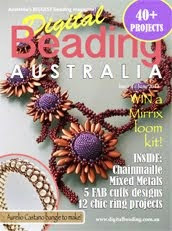 This is a substantial book weighing close to 1kg, so the postage costs are quite high. It will be dispatched using standard Royal Mail services and prices include a signed copy of the book, packing and postage broken down into within the UK, Europe and the rest of the world. I will work as fast as I can signing books, hand writing envelopes and walking to and from the Post Office, but I am a one woman show and despite being a gym bunny I can only carry so many 1kg books at a time, so please allow sufficient time for delivery. 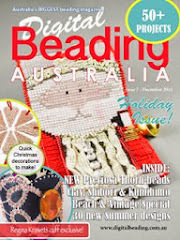 Please also note that the upcoming holiday season may cause postal delays and is beyond my control. 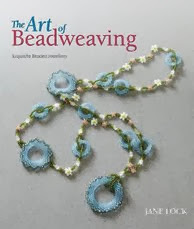 Other exciting news is that I've also teamed up with The Bead Shop (Nottingham) Ltd. who will be hosting a book signing event on Wednesday the 14th December from 5pm until 8.30pm. I'll be there signing books and chatting to people and the store is offering anyone who purchases a copy of the book at the event a £10 gift voucher to spend in the store. 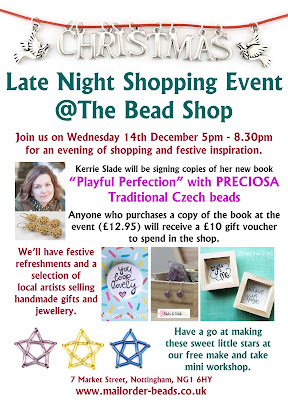 But it's not just me - this is part of a late night shopping event and so there will be local artists selling handmade items, mini workshops and even festive refreshments, so it promises to be a really fun evening. 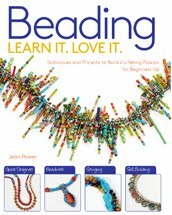 Writing my first book has been an amazing and very rewarding experience but it has also been enormously hard work. 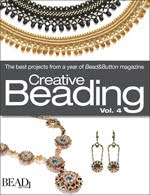 I have put my heart and soul into producing the very best work that I can and I am happy with the end result because it is very 'me', so I do hope that it brings you many happy hours of beading enjoyment. 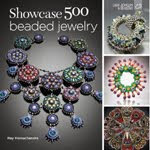 This book has my name on the cover, but its creation was very much a team effort and so I would sincerely like to thank Preciosa Ornela as a whole for the opportunity and the continued support of my work, the Preciosa Ornela team members and graphic designer for a huge amount of technical help and patience and my husband Simon and my friends for all of their encouragement, reassurance and practical help - thank you! 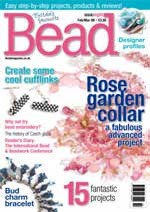 Later this month the second ever National Beading Week gets under way here in the UK, running from the 30th of July to the 7th of August. 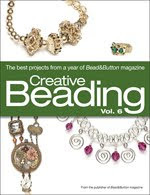 Following on from last year's success, it promises to be an even bigger and better celebration of all things beady with lots of exciting events taking place around the country. Take a look around the website by following the link above and find out how you can get involved in National Beading Week! 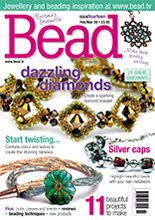 I'm delighted to have teamed up with The Bead Shop (Nottingham) Ltd. again this year and I will be teaching my Daisy Chain Bracelet at the shop on Saturday the 6th of August. 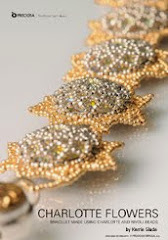 It will be a 3-hour class and although we won't be able to make a full bracelet during that time, we will cover all the important points and there will be detailed instructions provided to enable you to confidently complete your bracelet at home. 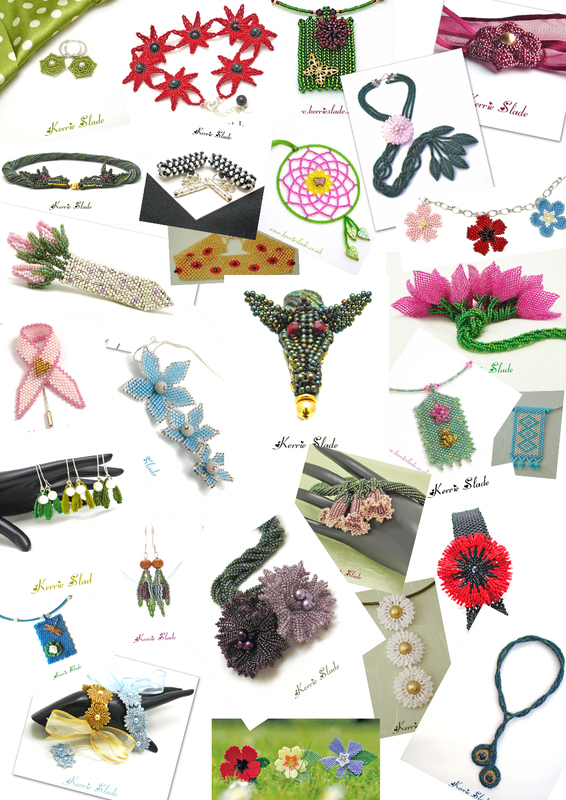 I will also be bringing along some finished samples to give you ideas of other ways to use these realistic little flowers. 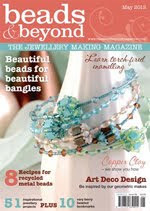 You can see some of the bracelets I've made below, but there are virtually endless colour variations you could try. 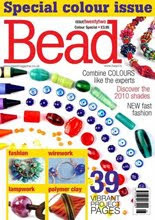 The Bead Shop stocks a wide range of the beads and pearls we will need, so we will have great fun choosing colour combinations before we get started - always one of my favourite parts of the class! 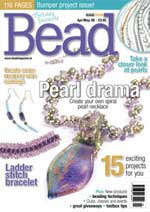 My class will run from 10am until 1pm and in the afternoon The Bead Shop will be hosting one of their regular informal bead groups from 2pm until 5pm, which I will also be attending. 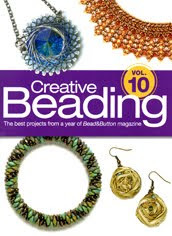 If you stay for the afternoon session you can carry on with your bracelet or bring another project with you to work on while chatting to other beaders. 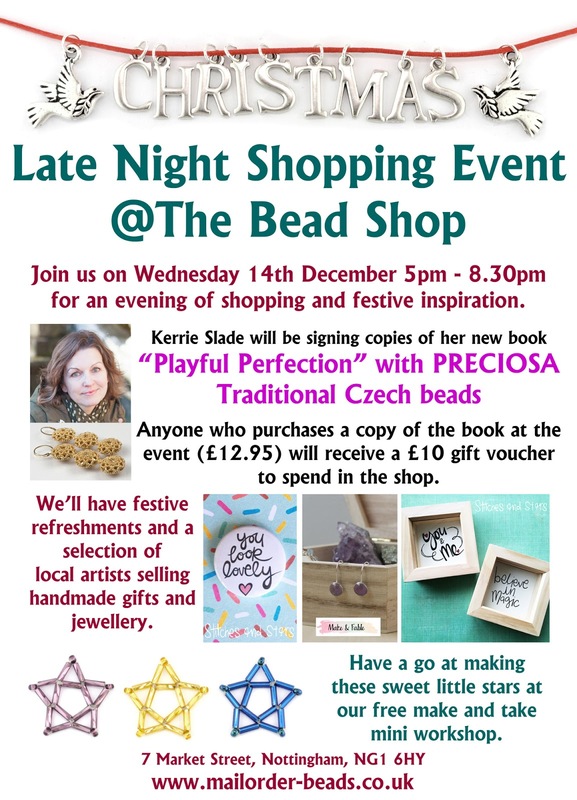 These sessions always have a lovely relaxed and friendly atmosphere, refreshments will be available (the shop asks for a £2 contribution for this) and the light and airy classroom is right above a store full of beads. 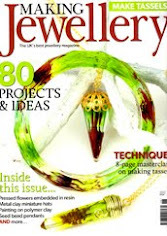 So Saturday the 6th of August promises to be a very enjoyable day and while composing this blog post, I have just heard that there are only 4 places left on the workshop - so if you are thinking of booking, don't leave it too long! My new book - Playful Perfection! 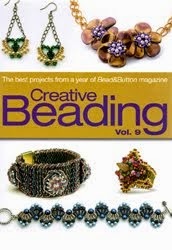 Creative Beading Volume 9 - Gumdrops in my Garden and Spikes in Bloom. 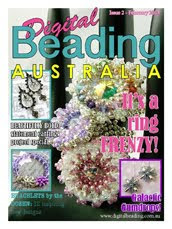 Digital Beading Magazine issue 11 - Pirouetting Pips Bracelet. 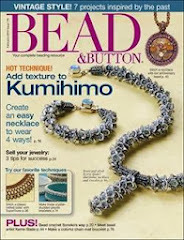 Kumihimo Bracelet (free online project with Preciosa Ornela). 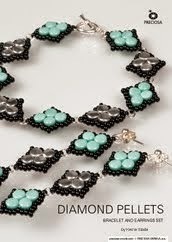 Diamond Pellets Set (free online project with Preciosa Ornela). 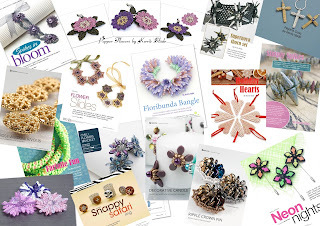 Bead & Button December 2013 - Flower Slides (free online project).